Reference number for this case: 14-October-54-Biesheim. Thank you for including this reference number in any correspondence with me regarding this case. The regional newspaper Dernières Nouvelles du Haut-Rhin for October 16, 1954, had reported a sighting of a "flying saucer" on October 14, 1954, in the region of Colmar. A reader from Wintzenheim who was at approximately 06:10 p.m. between Biesheim and Neuf Brisach told them that in his south there was a colored ball that was heading south at a height of about 800 to 1000 m, and went down sharply as if it wanted to land somewhere in the country of Baden in Germany. Biesheim. -- In yesterday's issue we reported that two motorists who were between Niffer and Kembs saw one of these mysterious celestial body which are talked about so much at this time and was moving at breakneck speed. This phenomenon was also observed by one of our readers, Mr. F. S. of Wintzenheim who was at the indicated hour in Biesheim and Neuf Brisach and therefore saw this object from the north side. From his description it was a colored ball that was heading south at a height of about 800 to 1000 m and descended suddenly as if it wanted to land somewhere in the country of Baden. Biesheim: in yesterday's issue we reported that two motorists who were between Niffer and Kembs saw one of these mysterious celestial body which are talked about so much at this time and was moving at breakneck speed. This phenomenon was also observed by one of our readers, Mr. F. S. of Wintzenheim who was at the indicated hour in Biesheim and Neuf Brisach and therefore saw this object from the north side. From his description it was a colored ball that was heading south at a height of about 800 to 1000 m and descended suddenly as if it wanted to land somewhere in the country of Baden. It is not at all my habit to "advertise" a book or anything, and I have no interested relationship with the author, but I wanted to say a word on the book by Christian Valentin, "Mythes et Réalités des Phénomènes Aériens Non Identifiés" (i.e. "Myths and Realities of Unidentified Aerial Phenomena" (cover on the left) , ref. [cv2]; which, as its subtitle indicates, is about Alsatian UFO sighting reports and the saucer lore in Alsace. I think Alsatian ufologist and generally people interested in the UFO question, or in the history of Alsace, my region, would probably like this book. The author does not want to prove or disprove the possibility of extraterrestrial visitors or some other so-called "extraordinary" explanation, he rather offers a chronologically ordered review of Alsatian UFO reports, starting from the origin and stopping in 1980, based on known sources ufology, on the articles of the regional Press, and cases less known or even unreleased so far that he collected directly with the witnesses. His own comments are printed in a different color, references to the sources are always given. A very nice work in my opinion! The reader said that the "saucer" was going south, but at the same time he said it that it seemed to prepare to land in the country of Baden, in Germany, so in the East. As it went from his south to the east, it followed a path which is the one that was reported for the 06:10 p.m. meteor widely seen in the region that day. At that time, and still quite often now, the regional newspapers, when there is a case of a UFO or supposed UFO, are most interested in the credibility of the observation, considering an observation is credible when there are many independent or seemingly independent witnesses. The description is less their concern, we often see that no details are collected. Here, even more than most other reports of this meteor event, the information is extremely meager: we do not know if it was silent or noisy, we do not know if it was luminous or not, we are told it was colored but the color or colors are not specified, it is not known if there was a trail or no trail, there is no displacement angle, no elevation angle, no angular velocity, no angular size. [dh1] "La soucoupe était également visible dans la région de Colmar", article in the regional newspaper Dernières Nouvelles du Haut-Rhin, France, October 16, 1954. 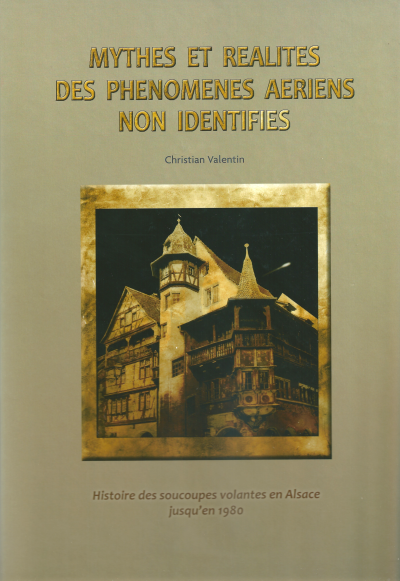 [cv2] "Mythes et Réalités des Phénomènes Aériens Non Identifiés - Histoire des soucoupes volantes en Alsace jusqu'en 1980", book by Christian Valentin, Grimoires d'Alsace publishers, France, page 39, 2012. 0.1 Patrick Gross April 27, 2014 Creation, [dh1], [cv2]. 1.0 Patrick Gross April 27, 2014 First published.